It is so nice to read people saying they are happy to see Liz back on tv. You know you’ve missed her on screen, but you don’t really realize how much till you see her in something new. She’s so deeply gifted and her commitment to her work is so inspiring! While this episode was better than the past couple of weeks, it still wasn’t one of the best. 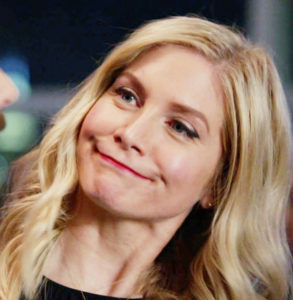 However, it did feature Elizabeth Mitchell, and it’s always good to have her on my TV screen (does anyone else still miss Juliet?). We found this piece about the episode of Blindspot with Elizabeth. The first part is the official press release of the episode and then we added the two nice things about her they wrote in the review. The team discovers an international conspiracy when a deadly weapon is stolen, Jane (Jaimie Alexander) supports Weller (Sullivan Stapleton) when someone from his past dredges up painful memories, and Patterson (Ashley Johnson) and Rich (Ennis Esmer) contend with their newly-released hacker accomplice. Roz: That suit is amazing, but I want to give the awesome to Elizabeth Mitchell as the deranged mom in the Star Wars plot. It’s always great to see her back on TV even if she was playing a bad guy this week. Cay: It was great to see Elizabeth Mitchell (Scarlett) – I loved her in Lost and Revolution. We were looking into some Blindspot‘s related accounts and we noticed that Martin Gero (Blindspot’s EP) said something nice on twitter about Elizabeth after 23 minutes from the beginning of the episode. So so stoked to have Elizabeth Mitchell on the show. Elizabeth Mitchell delivers a spectacular guest performance as Scarlett Myers and the revelation that Evan is trying to save his son from his mother plays out in a perfect parallel to Linda’s revelations. “Everybody Hates Kathy,” also has some pretty phenomenal guest stars, and while Scarlett Myers might be on her way to prison, it would be a shame if Heather Burns and Lisa Emery shrank into the background once again. Hey, we thought to post the ratings of the episode with Elizabeth. You can still watch the episode on NBC site. Hey lovelies, we’ve heard from Liz… This woman is so freaking adorable! We really can’t help it, we just adore her so much! She read us here we all didn’t know about her guest appearance on Blindspot last night. Have you guys got the chance to watch it yet? 🙂 She was amazing and something totally unexpected! The episode is available on NBC site (US only).